Klaus Schuch, born 1963 in Vienna, is expert on techno-globalisation, research and innovation policies and evaluation. At present he is Director and senior scientist at ZSI (Centre for Social Innovation), Austria. 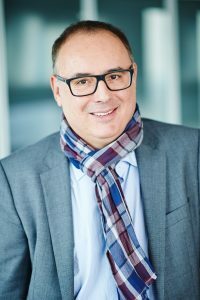 Klaus is also managing Director of the Austrian Platform for Research and Technology Policy Evaluation. Klaus is and was engaged in a large number of national and international projects. From 2009 to 2012 he analysed the Austrian RTI policy and its implementation under ERAWATCH and since 2015 he is national correspondent for the EC’s Research and Innovation Observatory. In 2007 he was scientific expert of the CREST Working Group on internationalisation in science and technology and in 2012 member of the external expert group of the European Commission to advice on the new European RTI-internationalisation strategy. In 2016/2017 he was delegated to the ERAC Working Group on Impact Measurement. Among other assignments, Klaus is also Austrian delegate to the European RTD Evaluation Network and member of the COST Scientific Committee.